Are you looking for a stylish coffeemaker to fit in your modern kitchen or office? Look no further! All this and more is possible with De'Longhi Nespresso Pixie. Although seeming very small at first glance, it certainly has nothing to be ashamed of. Not only will you appreciate its smart design, but also how fast, powerful, efficient and affordable the device is. The pressure pump, operating at 19 bars, rivals much larger coffeemakers. It preheats in 25 seconds, which makes it the fastest Nespresso device. Its compact body has a fresh appearance, mainly thanks to the use of bold colors. Gently textured metal finish of the aluminum side panels do not only add a nice touch but are also organic as from 98%, they are made from recycled capsules. The optimized flow and the fast thermoblock take care of the ideal result and brighten your daily coffee routine. A cup stand be adjusted so that you can make a tall glass of coffee specialties. Its operation is extremely simple: Insert the capsule of your choice, choose lungo (110 ml) or espresso (40 ml) and your work is done - the capsule is perforated, the coffee pours into the cup with the help of 18bar pump and the machine disposes of the used capsule into the container. At the end, it switches off automatically. The removable water tank fits 0.7 l - if the water level gets too low, the backlight will give you a notification. 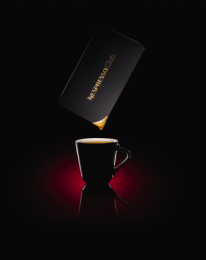 Each of the Nespresso capsule contains exactly the right amount of ground coffee with the unmistakable, full aroma. Different kinds and flavors are distinctly distinguished by colors. The capsules are sealed, keeping the coffee in airtight conditions so that it remains fresh for a long time. They are 100% recyclable - made of aluminum and foil which prevents direct contact with the metal. Nespresso uses only the finest coffee, the so called "Specialty" or "Gourmet", which comprise only 1-2% of the global production of coffee. These carefully selected beans are defect-free, of the ideal size, density and color. Like wine, they have characteristic and unique taste. Based on these qualities, Nespresso coffee is referred to as Grand Crus. The selection of 19 kinds of Grand Cru coffees satisfies any taste, at any time of the day. Each of them has its own unique aroma profile. For each mixture, our experts seek the appropriate roasting profile to fully develop the flavor and aroma of the beans. Nespresso uses the process of "split roasting", in which the coffee beans are roasted with regard to their origin so that they develop their full potential. The exposure to air can cause ground coffee to lose up to a third of its aroma in only two days. To avoid this, Nespresso developed hermetically sealed aluminum capsules, which completely isolate ground coffee from air and in that way help to preserve around 900 delicate aromas. Order coffee and accessories easily and fast - 24 hours a day, 7 days a week - call 800 26 33 33 for free or order online at Nespresso website. Your shipment will be delivered within 48 hours by PPL to your address or within 24 hours at any Czech Post branch. Ordered goods can also be picked up in the special Nespresso Boutique without waiting. For shipping to other EU countries visit this page NESPRESSO Krups Pixie Electric Titan XN3005. Für Versand nach Deutschland, besuchen Sie bitte Krups Nespresso Pixie XN300510. Chcete doručit zboží do Česka? 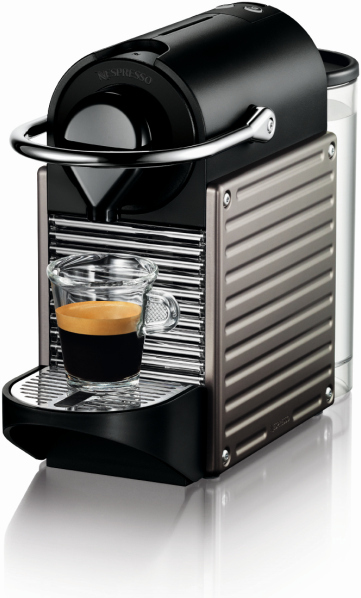 Prohlédněte si NESPRESSO Krups Pixie XN300510. Chcete doručiť tovar na Slovensko? Prezrite si NESPRESSO Krups Pixie Electric Titan XN300510. Magyarországra történő kiszállításért tekintse meg ezt a termékoldalt: Krups Nespresso Pixie Electric Titan XN300510.